What we will find is evidence consistent with natural cloud variations being the dominant source of climate variability since 2000. 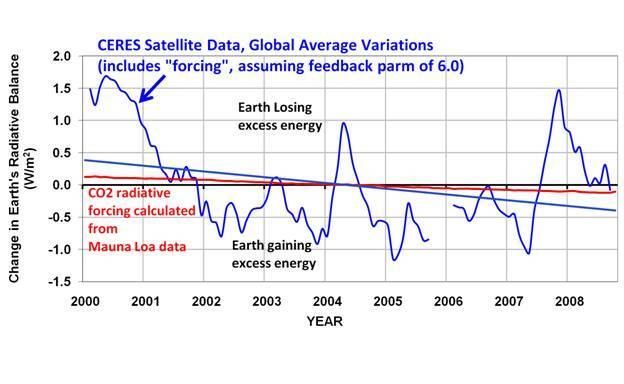 The following graph shows the variations in the Earth’s global-average radiative energy balance as measured by the CERES instrument on NASA’s Terra satellite. These are variations in the imbalance between absorbed sunlight and emitted infrared radiation, the most fundamental quantity associated with global warming or global cooling. Also shown (in red) are theoretically calculated changes in radiative forcing from increasing carbon dioxide as measured at Mauna Loa. Since there is some uncertainty in the absolute accuracy of the CERES measurements, where one puts the zero line is also somewhat uncertain. Therefore, it’s the variations since 2000 which are believed to be pretty accurate, and the exact dividing line between Earth gaining energy and Earth losing energy is uncertain. Significantly, all of the downward trend is in the reflected sunlight portion, not the infrared portion of the variations. We similarly can not reference where the zero line should be for the CO2 forcing, but the reasons for this are more complex and I will not address them here. 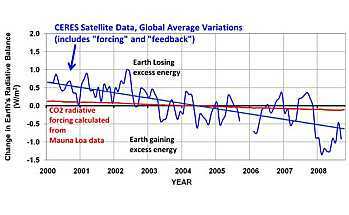 In order to compare the variations in the CO2 forcing (in red) to the satellite observations, we need to account for the fact that the satellite observes forcing and feedback intermingled together. So, let’s remove a couple of estimates of feedback from the satellite measurements to do a more direct comparison. Conceptually, the variations in the Earth’s radiative imbalance are a mixture of forcing (e.g. increasing CO2; clouds causing temperature changes), and feedback (e.g. temperature changes causing cloud changes). We can estimate the forcing part by subtracting out the feedback part. First, let’s assume that the IPCC is correct that climate sensitivity is pretty high. In the following chart I have subtracted out an estimate of the feedback portion of the CERES measurements based upon the IPCC 20-model average feedback parameter of 1.4 W m-2 K-1 times the satellite AMSU-measured tropospheric temperature variations. As can be seen, the long-term trend in the CERES measurements is much larger than can be accounted for by increasing carbon dioxide alone, which is presumably buried somewhere in the satellite-measured signal. In fact, the satellite observed trend is in the reflected sunlight portion, not the infrared as we would expect for increasing CO2 (not shown). As can be seen, the relative size of the natural forcings becomes larger since more forcing is required to cause the same temperature changes when the feedback fighting it is strong. Remember, the NET feedback (including the direct increase in emitted IR) is always acting against the forcing — it is the restoring force for the climate system. The main point I am making here is that, no matter whether you assume the climate system is sensitive or insensitive, our best satellite measurements suggest that the climate system is perfectly capable of causing internally-generated radiative forcing larger than the “external” forcing due to increasing atmospheric carbon dioxide concentrations. Low cloud variations are the most likely source of this internal radiative forcing. 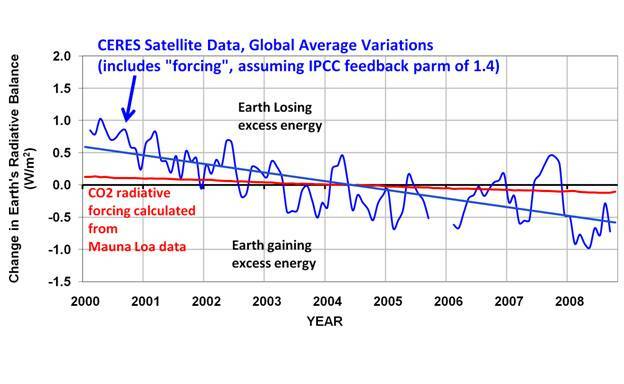 It should be remembered that the satellite data are actually measured, whereas the CO2 forcing (red lines in the above graphs) is so small that it can only be computed theoretically. 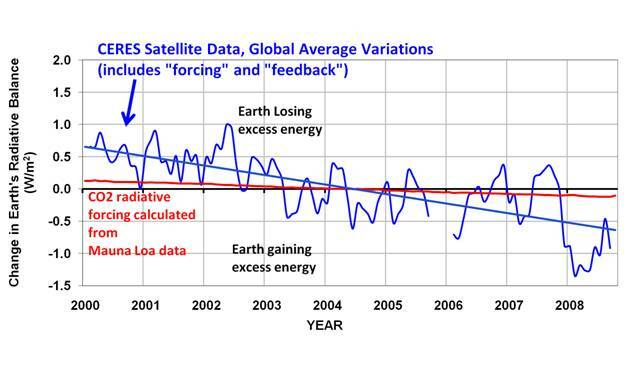 The satellite observed trend toward less energy loss (or, if you prefer, more energy gain) is interesting since there was no net warming observed during this time. How could this be? Well, the satellite observed trend must be due to forcing only since there was no warming or cooling trend during this period for feedback to act upon. And the lack of warming from this substantial trend in the forcing suggests an insensitive climate system. Any way you look at it, the evidence for internally-forced climate change is pretty clear. 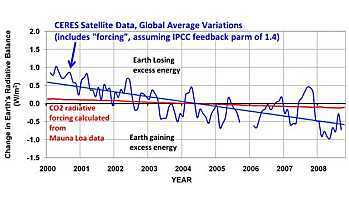 Based upon this satellite evidence alone, I do not see how the IPCC can continue to ignore internally-forced variations in the climate system. The evidence for its existence is there for all to see and, in my opinion, the IPCC’s lack of diagnostic skill in this matter verges on scientific malpractice. It is rare to hear such direct criticism between scientists; Spencer’s reasons for offering it are clearly extraordinary. This further erodes the IPCC process and the “consensus” view of global warming.